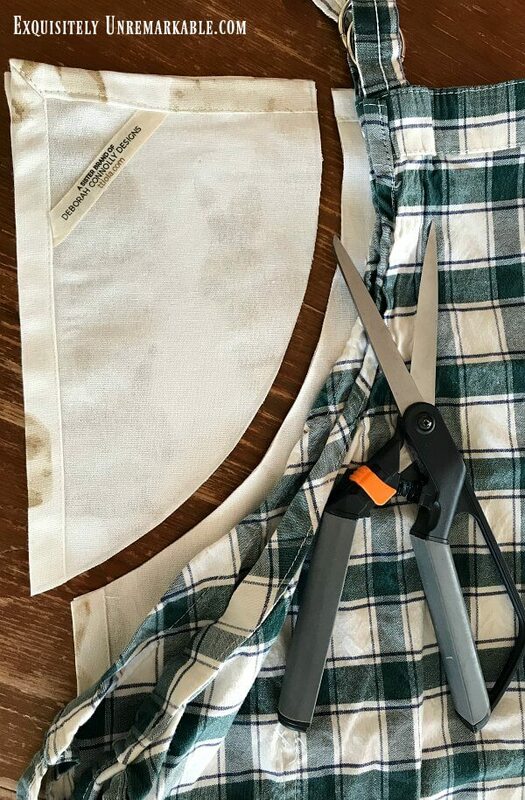 Whip up a full length apron from a kitchen dish towel in no time flat. 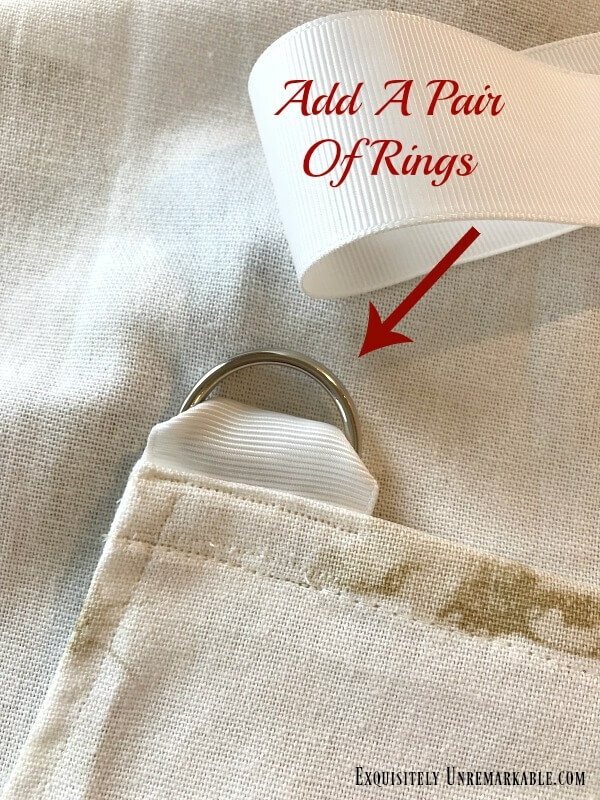 Try this quick sew or no sew DIY with my easy instructions. 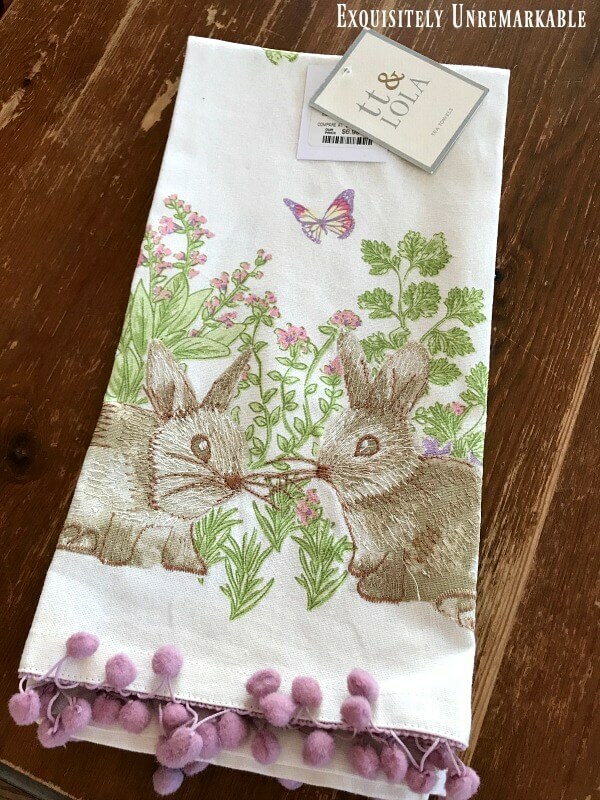 Several weeks ago, I was in HomeGoods and spotted the cutest embroidered bunny dish towel. Its delicate ball fringe and ridiculously low price made it impossible to resist. I knew immediately I was going to be able to do something special with it. However, I never even thought about the second towel. I barely even noticed it until I got home. It just came in the pack. Well, once I was finished crafting with towel number one, my attention quickly turned to number two. It was much less ornate than its mate. 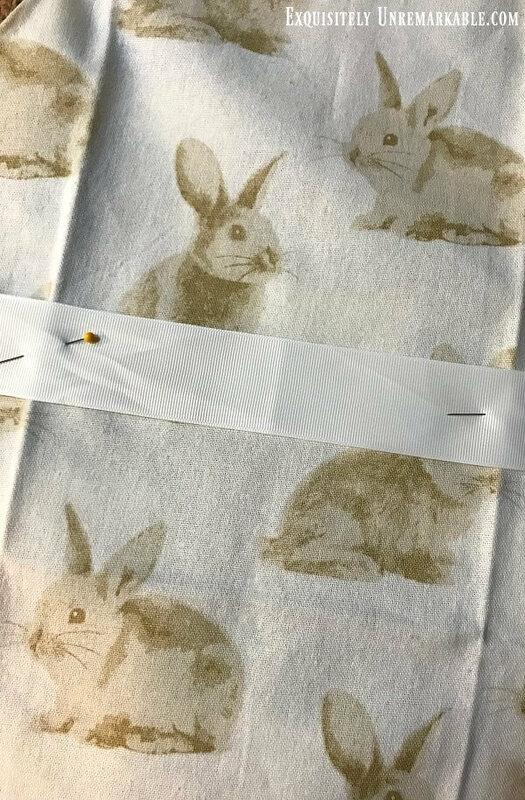 No embroidery, no spring colors, it was a rather plain, flat cotton fabric with brown bunnies. It still had that darling fringe though, so I knew it could also be fabulous given the chance. As I was trying to figure out what to do with it, I held it up in front of myself and the lightbulb went on. Apron!! 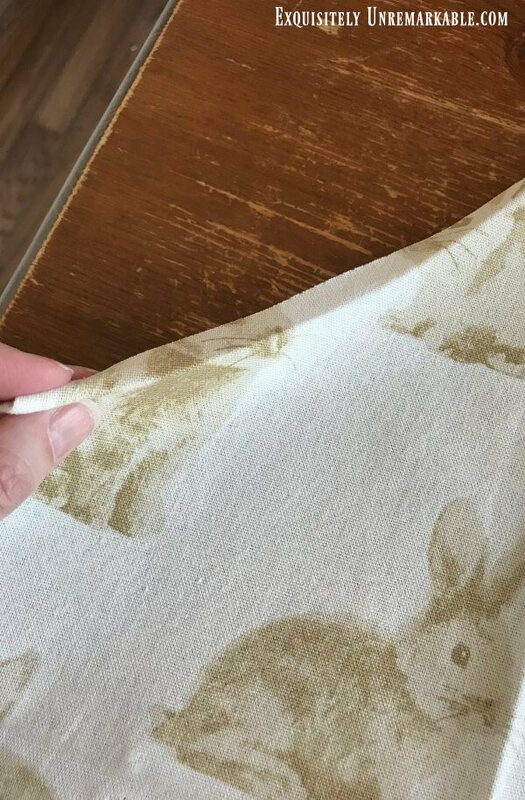 It was the perfect material, washable, the perfect size and I knew I could whip one up in a jiffy with some ribbon and supplies from my craft cabinet. So I got to work. First, I needed a pattern. 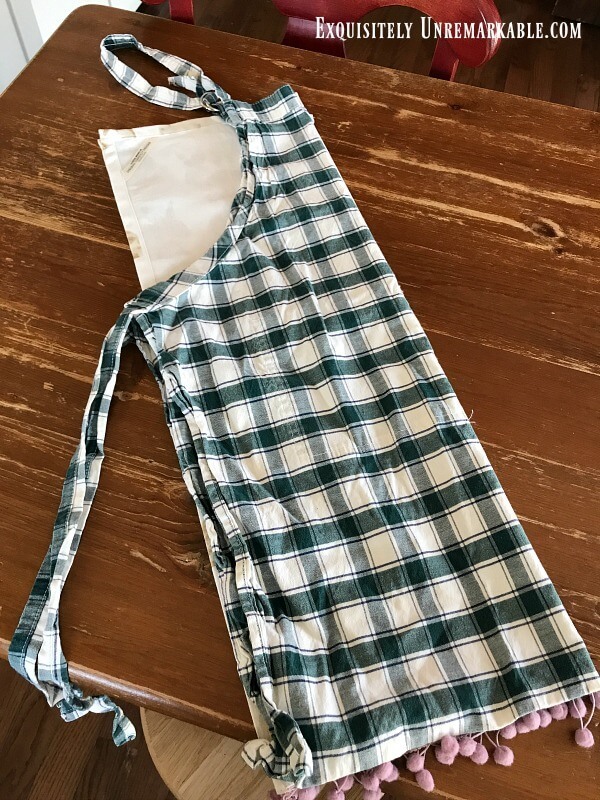 I didn't have one handy, but what I did have was an old apron I loved. I placed it on top of the kitchen towel and they were the same exact size. Now, I had a pattern. Check. Next, I folded both the towel and the apron in half, so it would be easier to cut and it would ensure symmetry. Keep in mind, I had the backside of the towel facing out. I grabbed my handy dandy Fiskars sewing scissors and I started cutting on my pencil line. My scissors are very old, but super sharp since I hide them and never let anyone cut anything but fabric with them. In the future I could get them sharpened if necessary, but I picked these up back in the late 1990s and they're still pristine. Once the fabric had been cut, I folded it over about 1/2" and creased it with my finger. I could've ironed it, to keep the crease in place, but the material was stiff and it stayed on its own. A solid fold makes sewing much easier. And that was the next step. I needed to finish the edges so the fabric would not run or fray. It also just looks better that way. For me, sewing is the easiest way to achieve this. 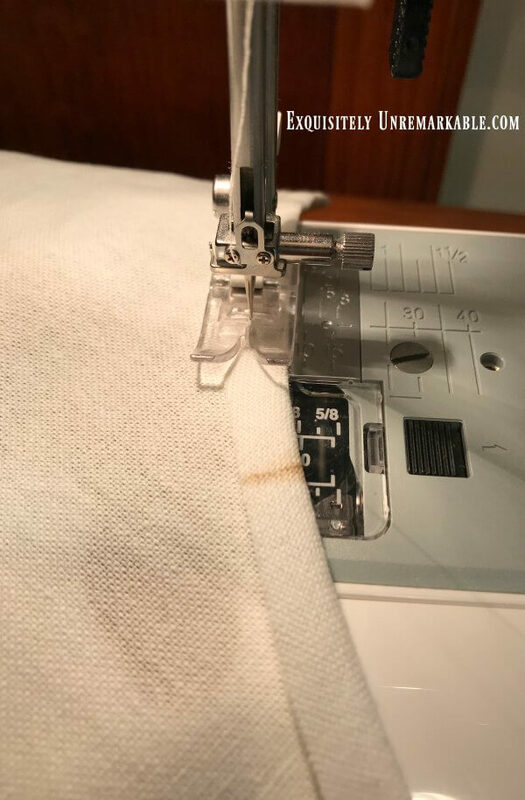 However, if you're not a seamstress, you can use a fusible iron on webbing or a fabric glue. With the seams completed, I had the base of my apron. Now I needed something to keep it around my waist and my neck. I opted for ribbon, since I already had tons of it on hand. 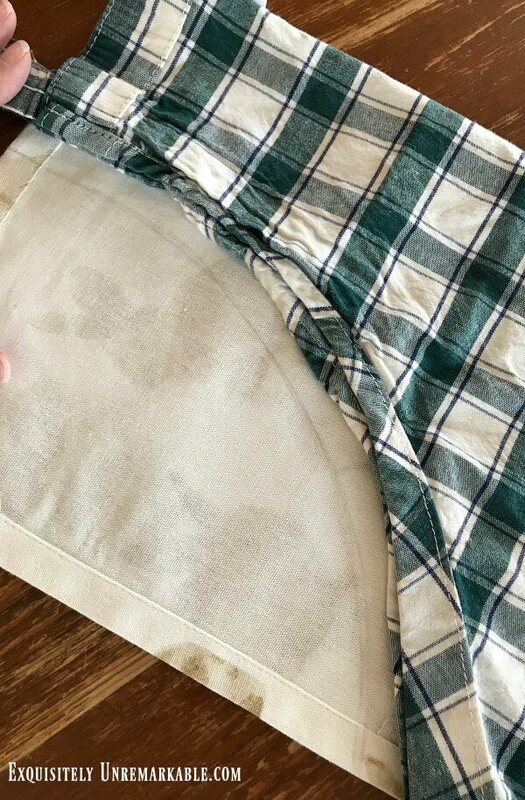 Again, using my old green apron as my pattern, I measured out ribbon and pinned it to the waist area of the towel and stitched it on. This is another place you could use glue. I was going to use a ribbon tie around the neck, as well, but I really liked the way my old apron fit securely. It had rings, so it never untied and fell off, there wasn't any annoying or painful knot to deal with and it was adjustable based on what I was wearing ~ turtleneck or tee. I had never used rings before, but turns out, they were easy to install. I just looped the ribbon through both of them and sewed it onto the apron/ towel. Then I stitched the long ribbon piece on the other side and I was done. I have to say, I was (and actually still am) pretty impressed with the way my apron turned out. It's very comfortable, it fits well and was unbelievably simple to make ~ one cut, two rings and a few quick stitches. And I've got another basic project that looks high end because of that darling trim. Trim that was already on the kitchen towel when I bought it. But nobody has to know that except you. Adorable. It would look cute hanging from a fun hook in your kitchen when not in use. I agree, Lorri! Utilitarian fashion and decor all in one. Awesome! 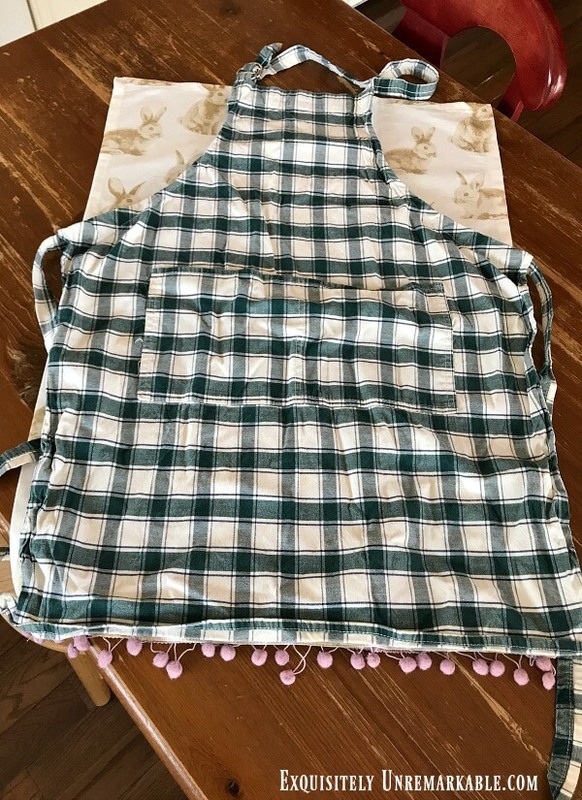 Hi Kim, WOW, you made the cutest apron using the nice towel. You are so creative and I love that you used up both the towels. I love the tutorial on how to make one. You make it look so easy. Thanks Julie! I was actually surprised that the second towel was different. I really thought there were two of the same in the pack and this one was perfect for an apron! Oh my gosh Kim this is awesome. I am very impressed with your crafty do self. 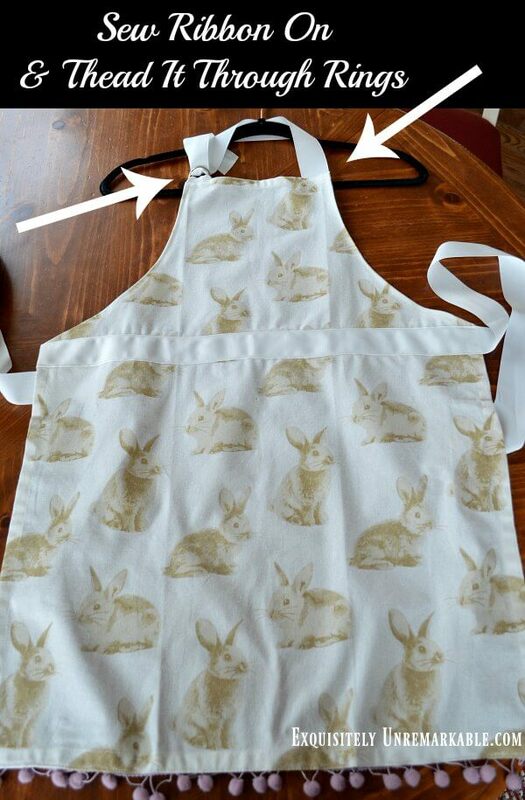 This apron is too adorable. I saw those towels at Home Goods too. They have some really sweet ones this year. Happy Friday and have a great weekend. That is so adorable. I love aprons and use them everyday. Thanks Betty! I have to say, I'm a big apron fan, too. There's something so charming about cooking with one on. That turned out adorable and it does seem easy! OMG you seriously amaze me, lady!!! That's adorable, and only you would think of it!! Kim, your apron is quite cute. I love the bunnies. Crafty and so creative. Kim, I tell you what, you think of the best ideas. Thank you for sharing. Kim, I love this! And pretty darn clever of you to create that beauty! It is so pretty and a great buy! A true two-fer and you know how much I love those! Have a great weekend! Love and hugs! Thanks Benita! It was a super lucky find. Gotta love HomeGoods!! That is so cute! You are so creative! So cute and perfect for Easter and spring. Love the idea of the ribbon ties and the rings. Looks super nice! Thanks Barb! I was hesitant to add the rings, I thought they'd be hard to do, but turns out it was a snap. I would highly recommend that method and tell anyone who wants to try it, to do so!! If I can do it, anyone can. What!?!?!?! That came from a towel! I can't believe how simple this project was to complete. The D-rings around the neck is a great idea. My daughter has a kid's sized apron and I'm forever tying knots in the neck loop to keep the front from slouching down. A D-ring would solve that in a jiffy. 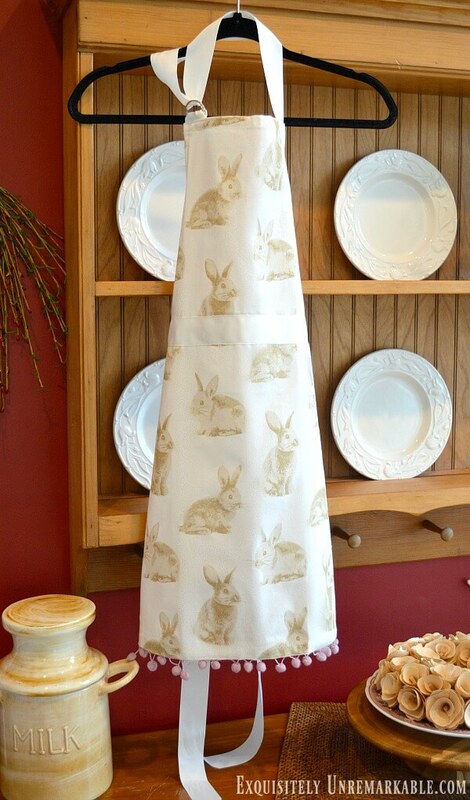 You'll have the cutest apron to wear when serving Easter dinner! Audra, it was so simple and while I was a little nervous about the rings, they were the easiest part of the whole project. And you're right, it fits so much better this way. Whau indeed!! I have been thinking about making an apron but I think and think and it never gets done. You make one in a blink of an eye!! :) They should have those "whau" icons here like they have in facebook. I love it Kim!! Thanks for the inspiration. That is so cute! 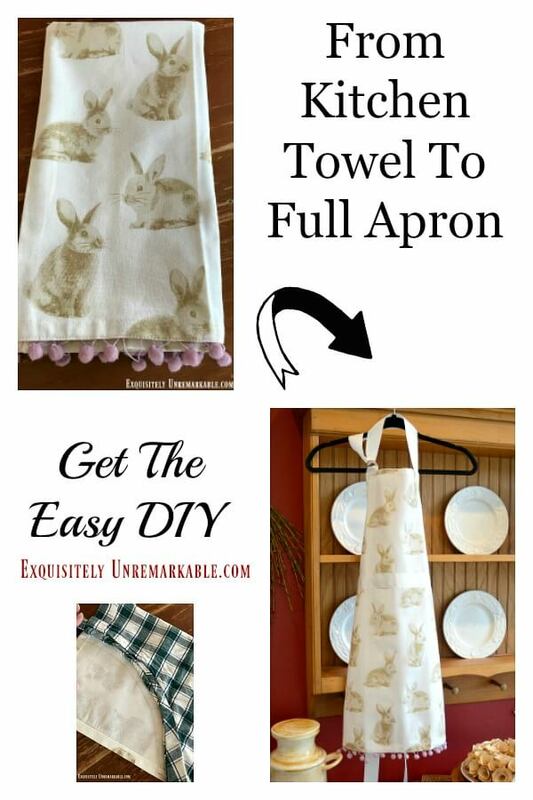 I have never thought of using a kitchen towel to make an apron. Hi Kim...wasn't sure if my comment went through so I tried a test. Lately I've had to sign in under my website. Strange. Let me kn ow if you got my original comment. It went through Jane!! Thanks for trying, I always love hearing from you. That is so cute, Kim! I love aprons and wear them a lot. I even wear them when I'm crafting. 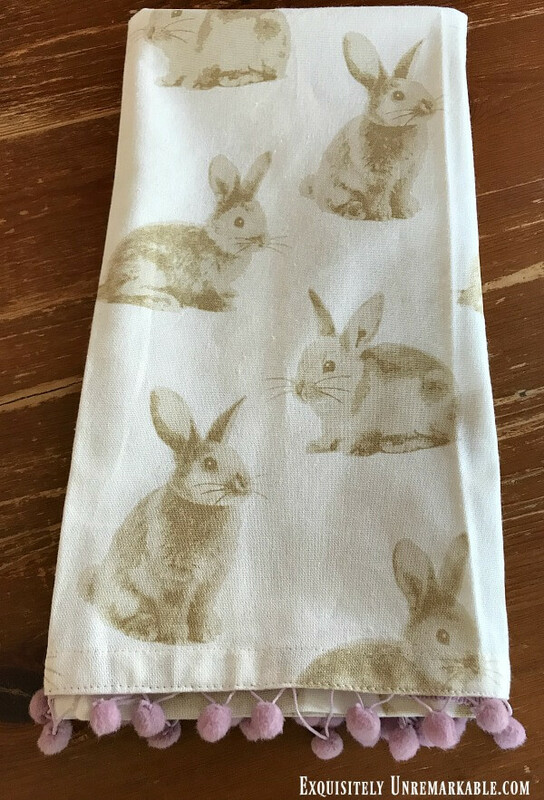 Home Goods always has the cutest dish towels. I think this is great and simply perfect for this Spring season. I will never look at kitchen towels the same way. This is adorable and VERY creative. I don’t use aprons when I cook and if you saw my attire you’d know why. I do, however, wear them when at the pottery wheel, and I have ribbon and rings too. So watch for some serious comp coming your way 😉. our mom likes bunnies too. sister she sews quilts too.